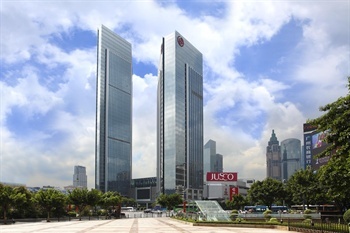 The Sheraton Guangzhou Hotel (Guangzhou Yuehai Xilaideng Jiudian) is a deluxe hotel located in the Tianhe central commercial area, about 3 km (2 mi) from Guangzhou East Railway Station and within easy reach to the Tianhe Sports Center. Sheraton Sweet Sleeper™ beds are in all rooms and help guests sleep more sound. Plush bedding and neutral tones help to make guests' stay a pleasant one. Some rooms have floor to ceiling windows and great views of the city. Other amenities include LCD flat screen TVs, safes, mini refrigerators and high-speed Internet access. In terms of dining, Yue has 15 private dining rooms and serves Cantonese cuisine, the Bene features Italian foods, and Feast, the all-day-dining restaurant, serves Western cuisine. For cocktails and snacks, guests may head to the Lobby Lounge. For event planners, this Sheraton hotel houses a large pillarless ballroom and variously-sized meeting rooms, which are well-equipped with high-speed Internet access, a sound and lighting system, LCD projectors and video conferencing facilities. During their spare time, guests may relax in the spa or make full use of the on-site fitness facilities, play a game of tennis or watch their kids play in the children's area.